Mike Pence press conference: Supports RFRA reform, complains about media. Pence at Tuesday’s press conference. 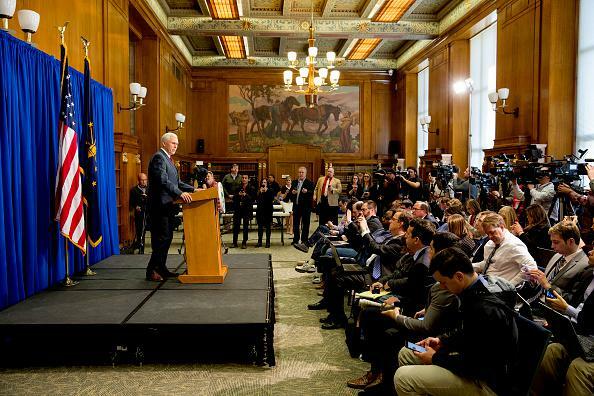 In a press conference that repeatedly blamed the media for “mischaracterization” of the state’s Religious Freedom Restoration Act, Indiana Gov. Mike Pence said he now supports reforming the law in a way that prohibits businesses from denying service to LGBT individuals. Pence repeatedly said that the law is not a “license to discriminate,” blaming the press for asserting otherwise—but during a Sunday appearance on This Week With George Stephanopoulos, it was Pence himself who refused multiple opportunities to dispute the claim that, for example, a florist could cite the law in refusing to work a gay couple’s wedding. Thank you all for coming. It’s been a tough week here in the Hoosier State. But we’re gonna move forward. Because as governor I have the great privilege of serving the greatest people on Earth. The people of Indiana. Let me say first and foremost I was proud to sign the Religious Freedom Restoration Act last week. I believe religious liberty, as President Clinton said when he signed the federal law in 1993, religious liberty is our first freedom. And it is vital to millions of Americans who cherish faith as I and my family do. But it’s also vital to the framework of freedom in our nation, and this legislation was designed to ensure the vitality of religious liberty in the Hoosier State. I believe Hoosiers are entitled to the same protections that have been in place in our federal courts for the last 20-plus years and are the law in 30 other states. But clearly, clearly there’s been misunderstanding and confusion and mischaracterization of this law. And I come before you today to say how we’re going to address that. We’ve been working over the last several days literally around the clock, and talking with people across the state of Indiana, talking to business leaders, talking to organizations across the country. And we have spent time in Indiana, enjoyed the hospitality of the people of Indiana, and we’ve been listening. Let me say first and foremost, as I’ve said to them, the Religious Freedom Restoration Act is about religious liberty, not about discrimination. As I said last week, had this law been about legalizing discrimination I would have vetoed it. This law does not give anyone a license to discriminate. The Religious Freedom Restoration Act in Indiana does not give anyone the right to deny services to anyone in this state. It is simply a balancing test used by our federal courts and jurisdictions across the country for more than two decades. Now let me say on the subject of the bill itself, I don’t believe for a minute that it was the intention of the General Assembly to create a license to discriminate or a right to deny services to gays, lesbians, or anyone else in this state. And it certainly wasn’t my intent. But I can appreciate that that’s become the perception not just here in Indiana but all across this country, and we need to confront that, and confront it boldly in a way that respects the interests of all involved. A personal reflection for a moment if I can. I abhor discrimination. The way I was raised was like most Hoosiers, with the golden rule, that you should do unto others what you’d have them do unto you. And I believe in my heart of hearts that no one should be harassed or mistreated because of who they are, who they love, or what they believe. And I believe that every Hoosier shares that conviction. But as I’ve said we’ve got a perception problem here because some people have a different view. And we intend to correct that. After much reflection and in consultation with leadership of the general assembly, I’ve come to the conclusion that it would be helpful to move legislation this week that makes it clear that this law does not give businesses the right to deny service to anyone. Let me say that again. I think it would be helpful, and I’d like to see on my desk before the end of this week, legislation that is added to the Religious Freedom Restoration Act in Indiana that makes it clear that this law does not give businesses a right to deny services to anyone. We want to make it clear that Indiana’s open for business. We want to make it clear that Hoosier hospitality is not a slogan, it’s our way of life. It’s the reason why people come here from around the world and they come back again and again. Because Hoosiers are the kindest, most generous, most decent people in the world. Let me say I believe this is a clarification, but it’s also a fix—it’s a fix of a bill that through mischaracterization and confusion has come to be greatly misunderstood. And I’m determined to address this this week. And to move forward as a state. And I know we will. Indiana has come under the harsh clare of criticism from around the country. And some of us get paid to be under that harsh glare and that criticism, so we don’t complain about it. But the things that have been said about our state have been at times deeply offensive to me. And I will continue to use every effort to defend the good and decent people of Indiana. I think it’s important that we take this action this week. I’ve spoken to legislative leaders all the way through the last hour and we’re going to be working to make that happen. With that I’ll be happy to take questions.